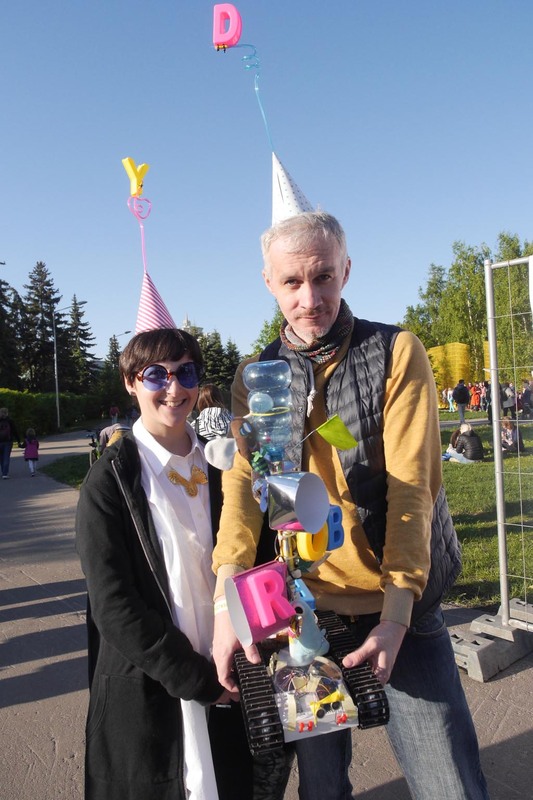 The Scientific truth proclaimers workshop took place at the Polytech Festival in Moscows famous Gorky Park. 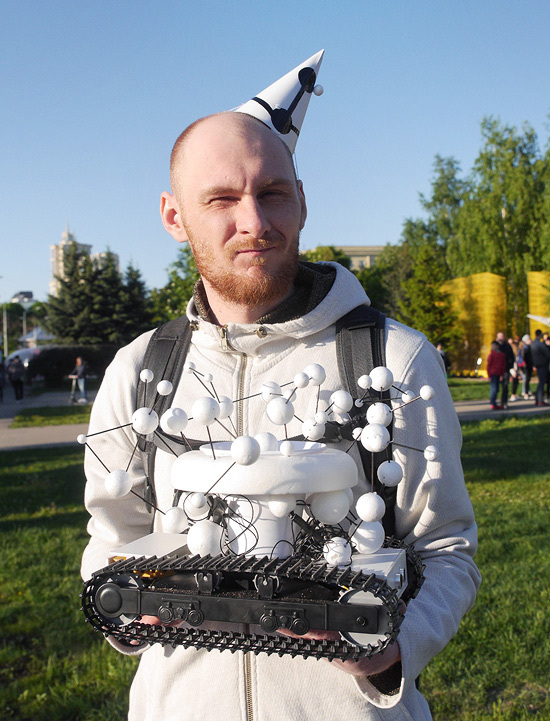 The festival is all about science, art and technology. In order to accommodate these themes, we have built robotic vehicles that drive around autonomously and broadcast scientific – but at the same time artistic – messages. As fake news are flourishing, the robots remind us of important, if not eternal, wisdoms of science, or evoke at least curiosity. During two intensive days, we built the self-driving truth proclaimers using toy excavators, megaphones, Arduinos, proximity sensors and excessive decoration materials as our basis. Three teams worked on three robots, not only soldering and hot glueing, but also theming their vehicles. This was achieved by creating audio files and designing the visual look of the wise vehicles. Vladimir is presenting the “PI‑recitor”. One of the robots was a black hole, which chanted a message created by artificial intelligence, beyond comprehension. Contrary to the first one&apos;s rough and apocalyptic looks, the second robot was sterile white and carried styrofoamy molecular structures. In accordance with its spherical structures, it was reciting the decimals of pi with synthesizer tunes. The third robot was totally different. It was a colorful punk robot packed with junk, shouting science quotes, sparing no swearwords. Kati and me had also made one robot as an example for the workshop. It was, somewhat modestly, promoting the hydrogen atom. The finished truth proclaimers were presented at the festival for more science lovers to enjoy. I want to thank all the workshop participants for building super robots and Polytech Festival for inviting us! Maksim Emelianov, the festival photographer, also took a nice set of pictures. If you want to build your own little propaganda robot, here are some example Arduino codes. And here are the schematics of the robots.